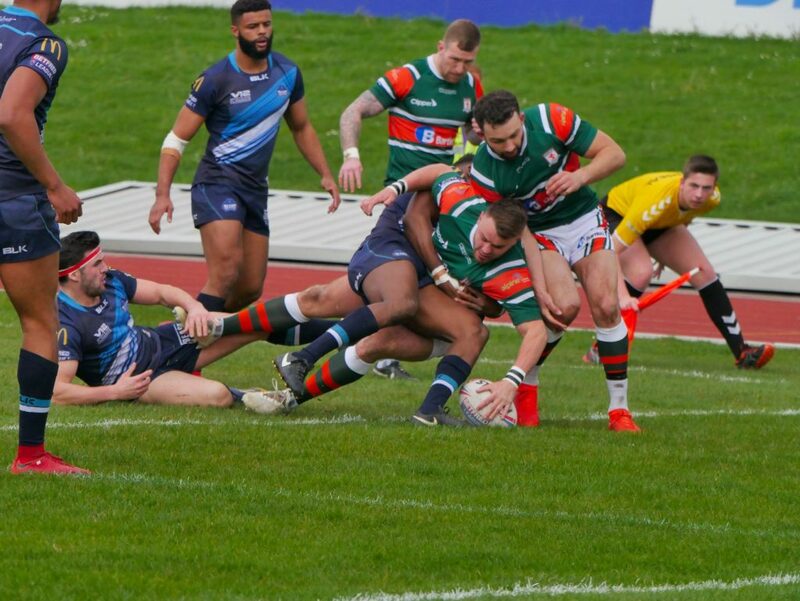 Hunslet RLFC made it four from four as they consolidated their early season table topping position by beating a plucky Coventry Bears side today (24 March 2019) at the South Leeds Stadium. Having won two of their first three games, Coventry look a side who won’t roll over easily this year, and indeed at times today they showed this. But it’s Hunslet who head the pack, and after a hard fought win at North Wales Crusaders last week it would have been easy to enter today’s game on autopilot. Not a bit of it though, as it only took 8 minutes for the home side to strike. Josh Tonks barging over from a short ball. No sooner had we restarted then Nathan Chappell registered a second in the left corner. Half back Reece Dean was missing this week (due to the birth of his son) so Joe Sanderson was recalled, his kicking boots were in fine form and Hunslet had an early 12-0 lead. Prop Adam Robinson was a thorn in Hunslet’s side last year for York, but this year wearing the Myrtle, Flame and White, he has proved to be a key signing. Too hot for the Coventry defence close to the line and Hunslet were 18-0 up in as many minutes. Ben Heaton stretched the lead to 22-0, before a superb Duanne Straugheir ball sent Gareth Potts over in the corner 28-0. It could have been more had Villa Halafihi not had a try ruled out for a double movement, but at the break Hunslet were well in control at 28-0. Coventry started the second half a different team. Probably having a flea in their ear from their coach they registered the first points when Sherratt went over to make it 28-6. The visitors then had a spell of pressure on the home line, but Hunslet’s defence this year is good and Coventry’s back was broken on 65 minutes when Adam Robinson, fresh off the bench took an inside ball to crash over 34-6. Almost immediately after Villa Halafini fed Ben Heaton to sprint over for his second of the afternoon, and at 40-6 the game was won for Hunslet. The icing on the cake came on 75 minutes though when Man of the Match Danny Nicklas broke the Coventry defence before slipping the ball to Josh Tonks, the ball then heading wide left to Dale Bloomfield who scored in the corner to give Hunslet a 44-6 lead. Coventry gained some consolation on the hooter as Petersen benefitted from a lucky bounce to score, but the victory was deserved for the home side. Hunslet playing some open and attacking football, but looking resolute in defence. Next week is a free hit in the Challenge Cup against Championship side Halifax, before Hunslet travel away to Whitehaven and Oldham, games that will really test Hunslet as to where they are at this season. Coventry Bears: Kameron Pearce-Paul, hayden Freeman, Errol Carter, Kadeem Williams, Reece Rance, Mitchell Shaw, Jacob Thomas, Peter Ryan, Nathan Conroy, Tobias Richardson, Kieran Sharratt, Chris Barratt, David Petersen. Interchange: Daniel Glover, Will Tully, Marcus Stock, Jacob Jones.